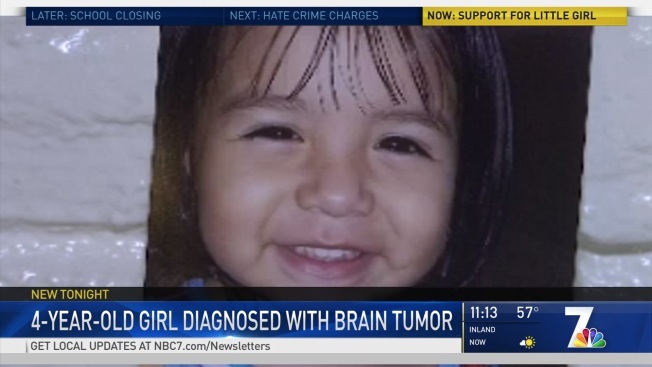 A Chula Vista family is rallying around a preschooler whose sudden diagnosis of a brain tumor turned her parents' lives upside down. A trip to the doctor's office quickly became a race to save the life of 4-year-old Ashley Moreno. “To go to a doctor’s appointment and from there to be sent to the emergency room and then to find out she has a tumor in her head and then they send her to L.A, that’s a lot for a family to bear,” Ashley’s grandmother Dulce Gibbons said. Ashley’s family gathered Thursday night to pray and support one another as the girl now fights for her life in the hospital. Just 10 days ago, a teacher noticed changes in the usually happy, energetic, healthy girl. She couldn’t keep her balance and would often stumble and fall when she walked. Ashley's mother took the child to the doctor in San Diego for a checkup, but the entire family was blindsided by the diagnosis. A CT scan revealed a tumor on Ashley’s brain stem. "She thought she was going to go in and the doctor was going to say it was the flu or something,” Ashley’s aunt Vivianna Martinez said. “She never expected to hear her daughter has a brain tumor." Ashley has since been transferred to a Los Angeles hospital where she's under the care of a team specializing in her type of tumor. But for those who love Ashley, the updates are becoming harder to hear. “The doctors came back and let them know that where the tumor's at, it’s inoperable. There’s no way they could even operate on it because it could kill her right there,” Martinez said. Ashley's 5-year-old cousin Gaylani Rojas said that despite the bad news, the family is keeping their faith. Gibbons said her granddaughter’s strength will help her as she fights in the hospital. “She’s a strong little girl and I pray all the time for her, I pray for all my kids - little small adults, all of them and I just pray that she comes out of this and she's cured,” Gibbons said. A GoFundMe account has been set up to help support Ashley's family. Both of her parents have not been able to work since her diagnosis.